Shrii Prabhat Ranjan Sarkar is the author of the 5018 musical compositions, called Prabhat Samgiita, in which “Prabhat” refers to the first name of the author of those songs and also means “dawn”.Samgiita means the combination of singing (lyrics and vocal music), instrumental music, and dance. So, this rising of a new day poetically means a new age in the field of music, and specifically regarding how lyrics, music, and dance can be conceptualized and presented: a new inspiration in collective spirituality through the blended beauty of these art forms. 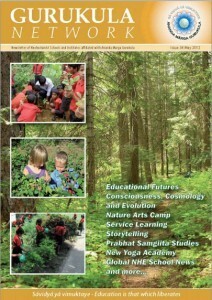 In the context of the profound crisis which presently humanity is facing, this message of optimism and inspiration from the Prabhat Samgiita’s author resonates throughout his entire work, which aims to inspire and to guide humanity towards a new age – out of the darkness of materialism and into the light of spirituality. Since 2010, in Brasil and in Argentina there is a growing interest in Prabhat Samgiita, and as a result local people have started a movement whose suggested name is Prabhat Samgiita For All – in Portuguese and Spanish, Prabhat Samgiit Para Todos. Two of the main activities of this movement have been annual tours which go through various cities in these two countries, and classes at a distance (through the internet). Thus far, the person who has been the main teacher of the vast spectrum of knowledge related to Prabhat Samgiit is Kirit Dave, a student of Shrii P. R. Sarkar who received from him the special task of helping to disseminate this knowledge to the West. Prabhat Samgiita (PS) songs touch on a wide variety of themes, including a good number which are appropriate to many social occasions – and especially express a vast array of spiritual or mystic moods and sentiments. The great majority of PS songs are in Bengali, a living language spoken by millions of people and the one closest to Sanskrit: “Ninety-three percent of the Bengali vocabulary comes from Sanskrit.”  Study of Bengali is advisable and almost indispensable for the true appreciation of Prabhat Samgiita. Attempts to translate literature of this caliber in a single way are nearly impossible. The idea behind the choice and selection of appropriate words is vital to the intended meaning, and is often difficult to translate. In our internet classes with Kirit, we have been learning to improve our pronunciation of the Bengali words. For this the lyrics in Bengali script are transcribed to an adapted Romanized script aimed to reflect actual pronunciation of the words. 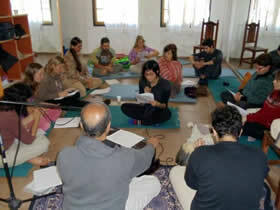 Every participant gets ample scope to practice the Bengali sounds. We study the sound carefully and then practice it. It is expected that gradually the students will be capable of reading the songs directly from the Bengali script. Besides pronunciation, we also study the meaning of each word, phrase, and of the song as a whole– especially its poetic meaning. Along this, the sentiment or sentiments (bhava) being expressed in the song are also explained, and the relation of these aspects of the songs to the author’s spiritual philosophy is also made. In other words, finally we put it all together as a song with spiritual wisdom and devotional message. towards that fountain of effulgence. I cannot bear the pain of darkness any more. This teaching gives opportunity to people who are not native Bengali speakers, especially Westerners, to learn the correct Bengali pronunciation and the word by word meaning of the songs, allowing people to better grasp the poetical significance of the songs. This diving into the pronunciation and meaning helps us to sing better and, as we go deep into the meaning of each word, we also have access to the sentiments portrayed by the compositions in a wider and more profound manner. It represents one more loving way to connect with the Supreme Consciousness. And without all this work, it could be much more difficult to achieve. So we see that our teacher’s methodology helps us in this learning. 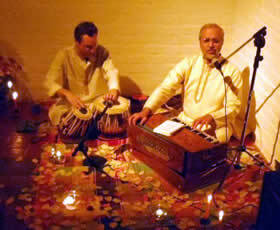 The PS songs introduce a new style or gharana of kirtans called “Prabhat Gharana” kirtans. Among other differences to the other Gharana kirtans, a distinguishing feature of this new style is that the bhava (sentiment) of the lyrics contain direct address to the Supreme Entity without a third person’s presence or intermediation. Regarding this, an important point of the classes is the attention given to the devotional sentiment expressed in the songs and its relation to the development of the own students’ devotion. So PS are presented as a powerful auxiliary means to the individual’s spiritual practices and development, and at the same time each student is stimulated to interpret and to relate to the songs’ content based on his or her own feelings and devotion for the Supreme Entity. That is, the people in the class are invited to present comments and experiences relating to the song being studied. Invariably, people have different interpretations and experiences of how the song has or may have already impacted their lives in the past. It is strongly believed that PS songs are a very personal treasure in that what a song means and how it affects a person is a very personal inner deeper experience of his or her sentiments. There is no such thing as just one official interpretation or translation of the song. By the way, a preliminary translation to English of the lyrics of each song is given before every class. But after the song has been studied, we really see that that translation is really “preliminary”, because the song’s meaning is explored and greatly expanded in the class. Another important aspect of the classes, both virtual and in person, is the patience and love with which the teacher gives attention and individual care to each student in his or her learning process. So, everybody has the opportunity to progress, regardless of previous instruction or their developmental level. Another important detail here is that all teaching is given for free, as a service. In our annual PS tour we organize various activities in different cities: concerts, workshops, and retreats, and now possibly also concert-classes. 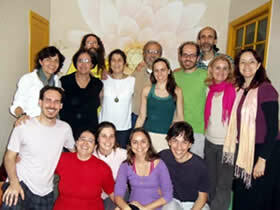 In 2010 the cities included were São Paulo, Campinas, Porangaba, and Belmiro Braga (Master Unit Ananda Kiirtana), in Brasil; in 2011, São Paulo, Campinas, Belmiro Braga, and Araruama, in Brasil; and Buenos Aires, Córdoba, and Rosário, in Argentina. The 2012 tour is just now in full planning. In these face-to-face meetings – in the form of workshops and retreats – the greater focus is on the musical aspect of the PS. Many of the PS songs are based on tunes of Indian classical music. Hence, it is very useful to learn about the basics of those classical structures in order to sing the song nicely. So we choose to study a particular raga or melodic structure, one at a time, and songs based on that particular raga are selected. That is, we select the songs based on a common classical structure. Then, in the presential classes, we study the theoretical fundamentals of Indian classical music, and, more extensively, its practical side, beginning with the basic natural scale of seven musical notes, going through exercises of ragas (melodic structures) and talas (rhytmic patterns), and then moving to the singing of songs, with special attention to their various ornaments. The Prabhat Samgiita For All movement and the learning related to it follow a development vision which includes participation of people according to their different levels of capacity and engagement; the main objective is to prepare people who are capable and willing to multiply this knowledge in all its broadness. Eventually this vision points to a more structured teaching/learning process that in the future we are planning will take the form of a new Prabhat Samgiita Academy. The musical instruments considered as basic or more important to the learning and playing of PS, because of its basis on Indian classical music, are the harmonium (more melodic, marking the raga) and the tabla (more rhythmic, marking the tala). The harmonium is pointed also as a very helpful instrument in learning to sing properly, and therefore a recommendation to students who wish to go deeper in learning PS is for them to acquire, or in some other way to have access to, the instrument. Some students already managed to fulfill this requirement. So, in the face-to-face meetings with the teacher, which until now focused mainly on the singing aspect, more attention will gradually be given also to harmonium learning. Recently an assembled group of the people who have been helping to organize activities in coordinated cooperation with the teacher concluded that Prabhat Samgiita is really a medium, not an end in itself. The feeling of union promoted by the collective work on this movement, whose center is spirituality or our devotion for the Supreme Entity, seems to us as more significant than the specific activity which, objectively, motivates this movement – that is, the learning and diffusion of Prabhat Samgiita. Without doubt the fact that we have a senior, dedicated student of Shrii P. R. Sarkar as our teacher has great importance for us because, beside his personal example and the teachings more directly related to PS, there is a whole lot of seemingly secondary or auxiliary teachings such as guidance about how to organize and do this and that – which in the end constitute a practical way of teaching and stimulating the development of a group working in coordinated cooperation. In other words, it’s also about how to organize a collective movement of all working unitedly. So we conclude that the subtle, spiritual art of Prabhat Samgiita can be a special means to do service to humanity, therefore integrating knowledge, action, and devotion. More information about Indian classical music and Prabhat Samgiita can be found on the website: songsofprsarkar.net– which until now is only in English but, in the near future, will also be in Portuguese, and possibly Spanish and still other languages. Shrii Prabhat Ranjan Sarkar. “Phonetics, Prefixes and Suffixes (Discourse 5)”. In: Varńa Vijinána. Kirit Dave. “A Word on Raga and Tala”. In: PS retreat booklet. July 2011.